Hayao Miyazaki, one of the founders of Studio Ghibli, one of the most famous directors in his field and a renowned artist has a box set of 11 of his feature films. At age 73, Hayao Miyazaki retired after stating that 50 years is a long time in his industry. So his films like Lupin III: The Castle of Cagliostro released in 1979 to The Wind Rises, his latest to date in 2013 can be found in his collection, which can be purchased here. As expected of Hayao Miyazaki, one of the most admired animators ever, all his films were great with strong female characters that develop throughout the film which contrasts in comparison to other animated females who too often portrayed as weak, and one-dimensional with no character development. And the absence of the typical “bad vs good” plot in his animations is replaced with ones that show characters surviving among the “bad” as realistically, the “bad” is not something that can be so easily gotten rid of. The animations themselves were well done with it’s characters moving with human-like movements, and drawn either by hand with the use of water colours with little computer graphics used. The environment in his films are always so detailed and they’re so beautiful, especially the sky. The sky in Hayao Miyazaki’s films are absolutely amazing. And of course I’m being completely biased when I say that Spirited Away was my favourite film as it was the first animated film I ever remember watching. It made me want to be just like Chihiro, a strong and kind girl. I was in love with the colours and I never really understood a lot of the characters until now. The themes are so well thought out and carefully shown throughout the film. Hayao Miyazaki’s films always leave a strong impression and he more you think about the meanings of his films, the deeper they seem. 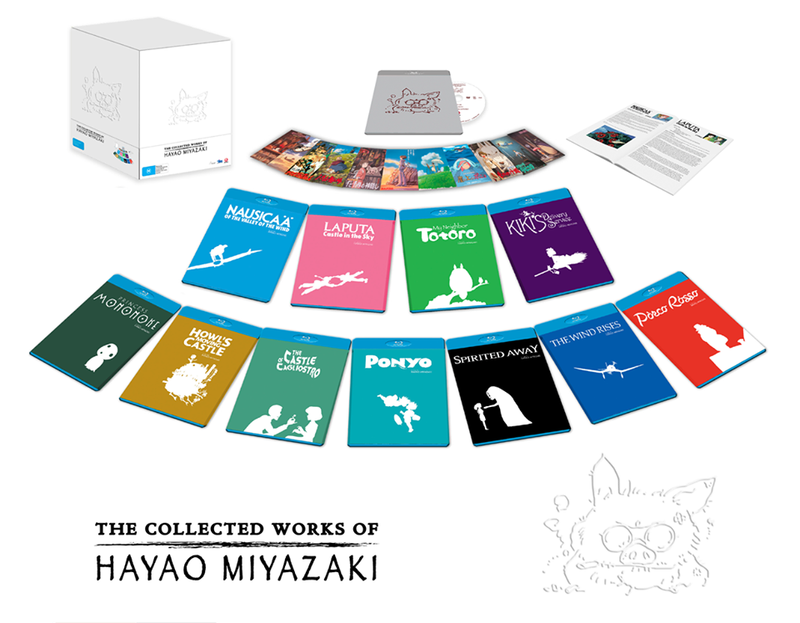 The Collected Works of Hayao Miyazaki is a box set that I’m super happy that we have and I’ve grown so attached to the characters with well thought out storylines. I highly recommend it and they’re never boring.